This was the extent of Arctic sea ice as seen by NASA’s Aqua satellite September 3, 2010. The entire north polar ice cap may well be completely melted off in five years. Of course, he thinks human-made global warming is to blame. So depending on which prediction you believe, Al Gore thought there would be no more ice at the North Pole by 2013 (five years after his speech in Germany), 2014 (seven years after his Nobel Prize acceptance speech) or 2029 (22 years after his Nobel Prize acceptance speech). It’s obvious which one Gore favored. He mentioned it twice in the quote above: 2014. Let’s look at the latest measurements of Arctic sea ice to check the former vice president’s prediction. Obviously, Mr. Gore’s favored prediction is clearly wrong. 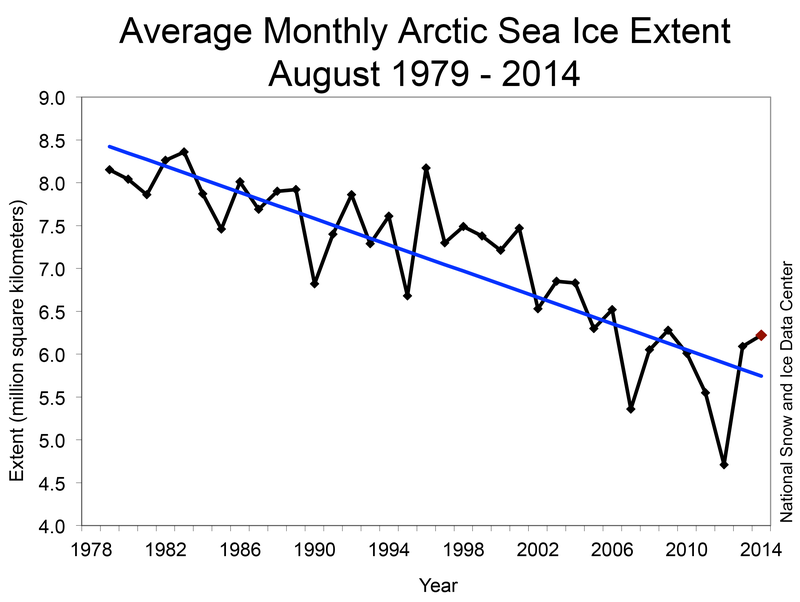 The dark gray line in the graph is the average Arctic sea ice extent as measured from 1981-2010. The gray area represents the range over which 95% of the measurements in that time period fall. The dashed green line represents the measurements made in the year with the least amount of ice on record (2012), and the blue line is this year. 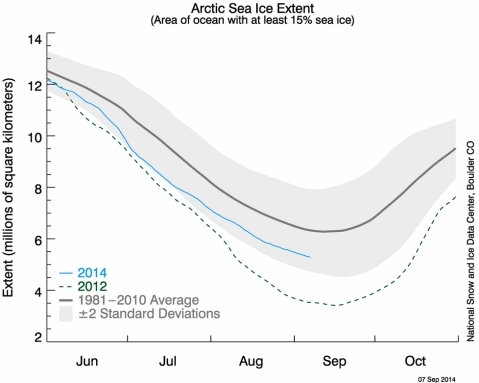 The amount of ice in the Arctic is below average, but it is clearly not zero. 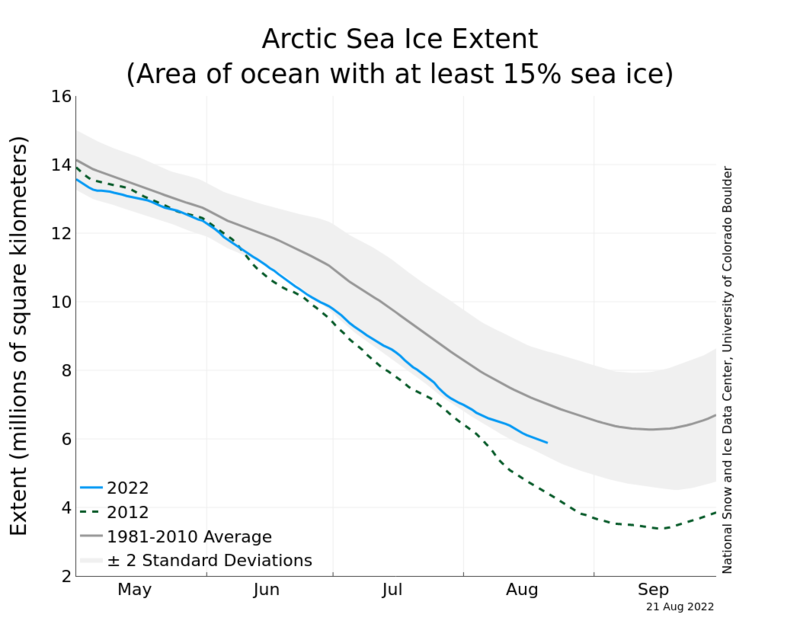 Also, there is significantly more ice in the Arctic than there was two years ago. 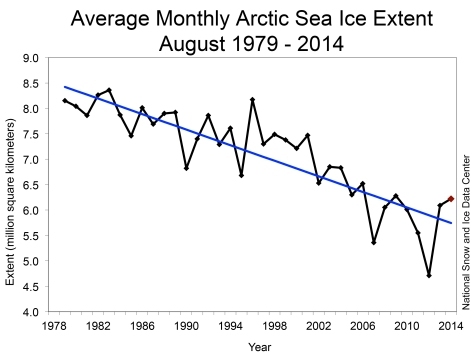 So we clearly have a losing trend when it comes to Arctic sea ice. However, it isn’t the trend of Vice President Gore’s favored prediction. That trend would have reached zero by now. 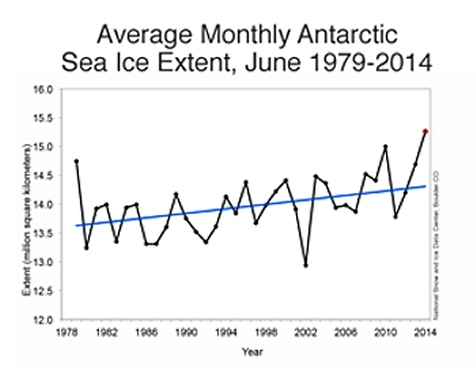 The average monthly Antarctic sea ice extent for each year since 1979. So whatever is going on with sea ice, it is certainly not global. While the Northern Hemisphere is clearly losing sea ice, the Southern Hemisphere is clearly gaining sea ice. If you want to claim that the loss of sea ice in the Arctic is due to human-caused global warming (as Vice President Gore and many, many others do), what is to blame for the rise in Antarctic sea ice? Global cooling? What an important point! I wish that those who are not terribly informed about global warming would notice the evidence of the antarctic ice thickening. Why are we always so eager to jump on the emotional boat first, then look at reality at a later date? Kendall, I agree that some people are eager to jump on the emotional boat before looking at the facts, but I think there is something more to this problem. How often do we hear about Antarctic sea ice? We hear about the thinning ice in the Arctic all the time and how it is endangering the polar bears. 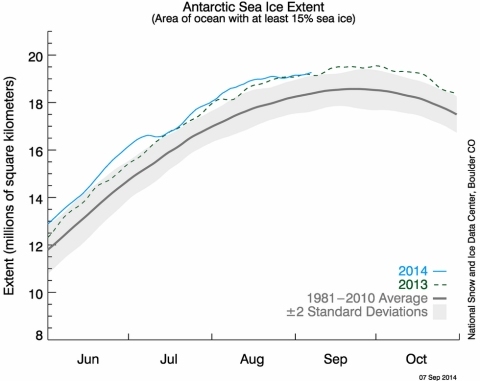 However, we just don’t hear much about Antarctic sea ice. How are people to know if they aren’t told? Indeed, if you go to the National Snow and Ice Data Center, it is very easy to find info on the Arctic sea ice extent. It is front-and-center on their website. 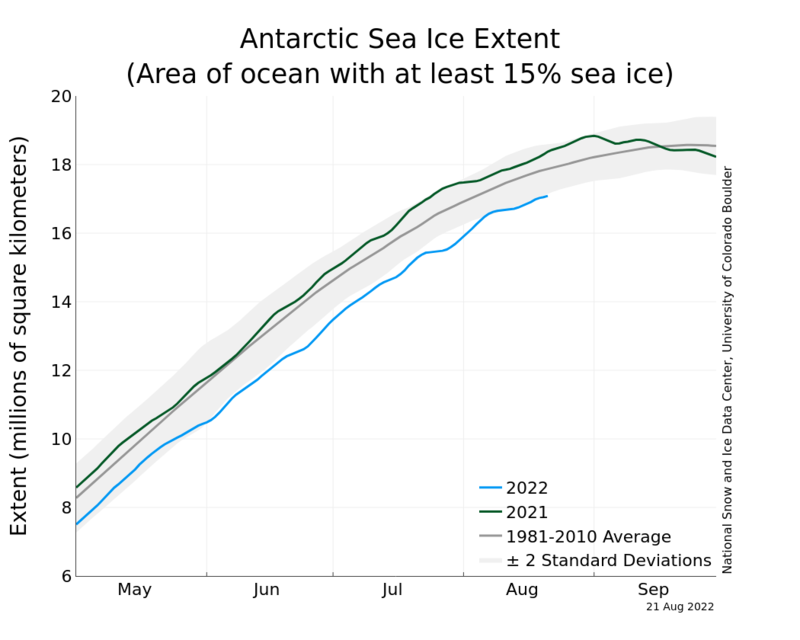 Can you find info on the Antarctic sea ice extent? It’s there on the site, but it is much harder to get to. Why? I’ve… never actually heard this before. Though I can’t say it surprises me that Climate Change Alarmists would leave this little tidbit about the Antarctic ice out of their reports. Thank you for educating me yet again, Dr. Wile. Thanks for this information. It’s important to call out people for blatant lies and predictions that mislead so many in this world, especially our children. Thanks for the correction, Zuzusmom! It’s tough to find your own spelling errors sometimes! You’re perfectly right Dr. Wile. I’m guilty of being influenced by others’ fear, even when I know better, so I have a bitter tendency in that area. I’m very blessed to have learned about global warming early on from your Physical Science textbook. I realize that other folks haven’t been blessed with the exposure that I have. Thanks for pointing that out to me. I should not be so critical! I was talking to a friend who is opposed to your view on global warming. He brought up this point: that since the south pole is a continent it’s not as much a concern. I assume that this is because if the north pole has ice recession, it could, in theory, recede completely away. While the south pole, being a continent, could not have that extreme result. If there is a local warming, shall we say, at the north pole, couldn’t that eventually have a global effect? Your article argues that global warming is not global, but local, is that correct? But that local change could have a global effect if the local change was particularly severe. Your friend might very well be right that the ice melt isn’t as much of a concern in Antarctica. However, that’s not the point of the article. The point is that the warming isn’t global, or we should be losing ice at both poles. Indeed, this is what global climate models predict. It’s just not happening, which indicates that whatever is causing these ice changes, it’s not global. It’s very likely that if the Arctic loses a large fraction of its ice that there will be global consequences. Once again, however, that’s not the point of the article. The point is that people like Gore (and many others) blame the loss on global warming. If they are right, the Antarctic should be losing ice as well. Since it is not, there is most likely another explanation for why it is happening. Jay – I think you’re inadvertently (I hope) providing incomplete information. Gore said the ice could be gone during SUMMER, not completely gone. He wasn’t trying to say that it would also be gone during winter. Also, you may be over-simplifying the Antarctic ice situation – it is currently under thorough study by numerous researchers and it is more complex than just areal extent. Thanks for pointing that out, Tim. It should be made clear that Gore was spectacularly wrong about the Arctic being ice-free in the summer, not the winter. I am sure that the Antarctic ice extent is very complex. I am also sure that the Arctic ice extent is also very complex. That’s my point. Both are very complex, so the idea that either one can be immediately attributable to global warming is simply not reasonable. I will say this, however. All climate models of which I am aware predict ice loss in both places if human-produced carbon dioxide is warming the planet. The fact that the Antarctic is not conforming to the models tells us, at minimum, that the models have (once again) made the wrong prediction. Thanks for the link, John. It is certainly true that land ice in the Antarctic is dwindling, mostly because of the West Antarctic Ice Sheet. However, we know that has nothing to do with climate change. Instead, it is caused by the geothermal activity under that ice sheet. Notice that based on their own graph, if we remove the West Antarctic Ice Sheet from consideration (since it cannot tell us anything about climate change), we see that the land ice has stayed fairly constant. Comparing your trend lines for Arctic and Antarctic we see that while the Arctic has lost about 3 million square kilometers in the same time the Antarctic has gained about 1 million. So worldwide that’s a 2 million km^2 loss. Yes, Chris, there is a net loss. However, climate models predict a loss in both hemispheres. Thus, there is clearly something going on that we don’t understand. How Should a Christian Deal with Tragedy? What Keeps a Young Adult Active in the Faith?